When designing for disaster zones and rural areas, adapting existing tools can often be better than inventing a new solution. 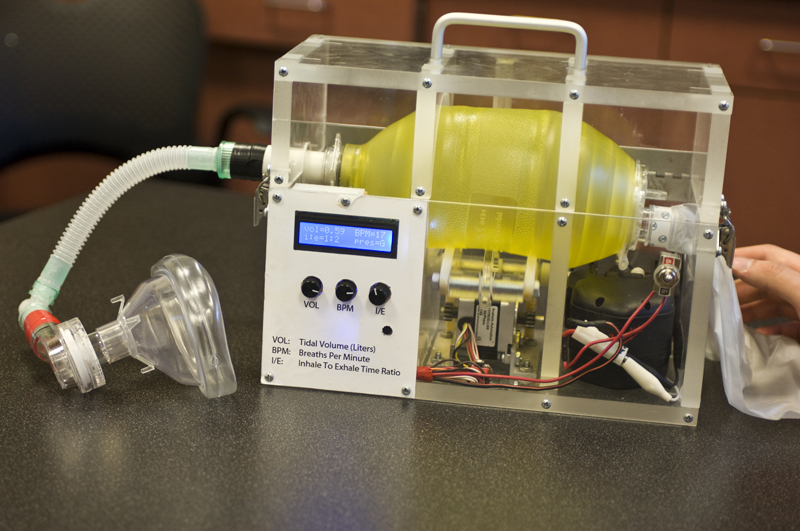 A group of MIT mechanical engineering students took such an approach in developing their new low-cost ventilator, a plastic-encased manual pump that looks like a project out of the pages of Make Magazine, but performs with the precision of a medical device. The low-cost ventilator consists of the sort of cheap manual pump that is ubiquitous even in rudimentary first-aid kits, connected to a battery and motor. A set of dials on the exterior of the box control the volume and breath cycles, while a gauge monitors pressure flow and prevents over-pressurizing of the lungs, which can occur when patients are being sustained through manual ventilation. The MIT solution costs only around $100 to produce, compared with the $30,000 price tag for the machines typically seen in U.S. hospitals. The students devised the prototype for a class called Precision Machine Design, in which they tackle real-life challenges facing hospital facilities. (It’s not the first low-cost medical device invented at MIT this year, in April we wrote about a $3 suction-healing system created by Danielle Zurovcik.) A doctor from Boston University Medical Center identified the need for a ventilator that could survive suboptimal environments, including in the event of a pandemic in the U.S., when it’s possible we’d be short hundreds of thousands of ventilators. The success of their first prototype led them to continue refining the product and to develop a second version in another course. Now patent pending, the ventilator could be just a few steps away from a license for manufacture and distribution.